Prevent water from seeping through gaps in your roof by getting in touch with the team at Taylor & Son Roofing. Possessing extensive training, experience, and exceptional industry knowledge we can provide prompt and professional roofing improvement solutions and services perfect for Melbourne homes. Covering the ridge of the roof, the ridge cap is an aesthetic addition that neatly joins two sections of the roof. 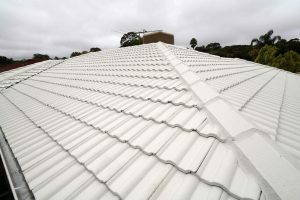 As well as acting as a visual enhancement to the roof ridge caps cover gaps in the tiled roofs surface, preventing the damaging intrusion of wind, dirt, and water into the property. Being exposed to environmental conditions such as winds and shifting homes the mortar securing the ridge cap to the roof can crack and flake away from the cap, leading to the ride cap being compromised or being completely removed when next subjected to high winds. To help prevent damaged or loose ridge caps from causing untold damage to your home the experts at Taylor & Son Roofing can conduct the detailed re-bedding of ridge caps for homes across Melbourne. After inspecting the condition of the ridge caps we can proficiently complete our re-bedding works to suit your roof’s needs and requirements. By employing a detailed and methodical process we can seamlessly repair and maintain compromised ridge caps to help our customers regain their confidence in the roofs above their heads. To stay safe and dry the next time it rains give our team a call on 0402 439 107 for competitively-priced and our renowned re-bedding of ridge caps.